I admit It was my mistake.I jumped into supermarket dressed just in the shorts and T-shirt.As I did many times before.Now the serious security guy with no compromise followed me to the compartment with diary products and informed me to leave LuLu because I was not dressed accordingly.I didn’t know what’s going on but didn’t want to argue.The guy told me there’s a poster at the entrance door informing about ”dresscode policy”.I didn’t want to write about that,I’m aware of the fact that shorts are not appropriate to be dresssed in Oman and I take as it goes.The end. Well,let’s take a look at the poster informing the ”dresscode policy”. 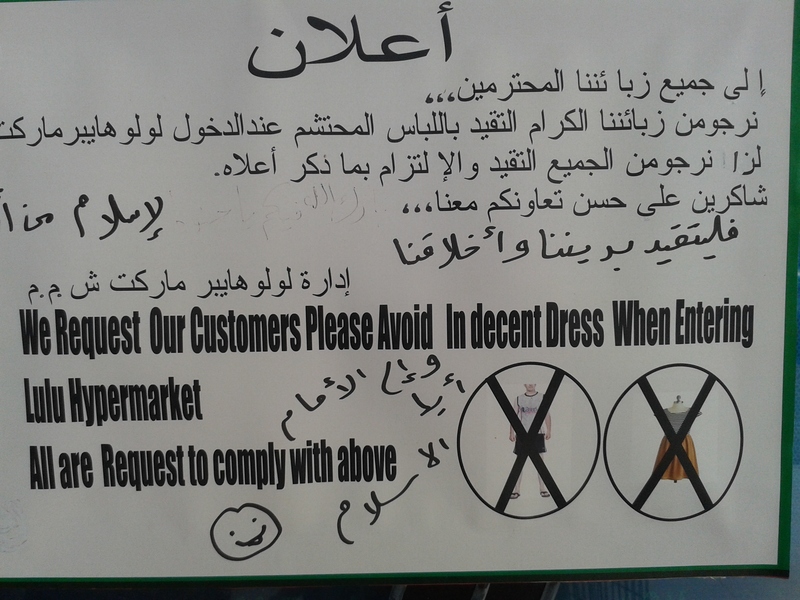 I think more expatriates should try to be more considerate when it comes to dress code. Not only when you are going into the shops. Exactly.Little change of the words and the meaning is completely different.